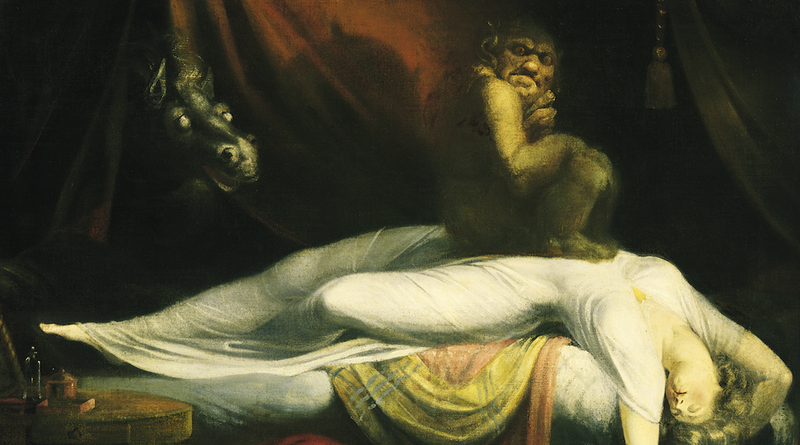 Scientists have been investigating nightmares for over a century. Their work has resulted in some seriously bizarre findings, but nothing is more strange than the discovery of what people's most common nightmares are. It's estimated that just 5% of adults suffer from nightmares regularly; and yet, the majority of people (surveys of young adults put the number somewhere between 70- and 90-percent) have still experienced a nightmare at least once in their lives, which actually makes them a fairly widespread phenomenon. Strangely, we know very little about what people actually dream about when they have nightmares. Part of the problem is that nighmares are so personal. To describe them, we spout anecdotes, relay hearsay in the form of second-hand accounts, or – increasingly – cite pithy internet listicles of dubious merit. And this is one of the biggest challenges for scientists who study dream content, or what we dream about. When asked to think of a nightmare, most subjects are likely to recall particularly intense, unusual, or otherwise salient nightmares rather than more typical experiences. This may explain why themes of falling and of being chased are among the most frequently reported themes in studies based on questionnaire or interview data while appearing much less frequently in prospective logs. In more than half of the studies, Zadra notes, the definition of a nightmare itself is inconsistent with the diagnostic standard, "as the awakening criterion is not specified." Such incongruities are, of course, to be expected; as our understanding of something changes, so do our definitions*. By this logic, we would expect earlier publications to work by one definition of nightmare, and, as the field progresses, more and more recent studies to hew closer and closer to the present definition. But this is not what we see. Specification of the awakening criterion is erratic, appearing in some studies but not others – and while the awakening specification makes its first appearance in research published in 1970, it is left out in studies as recent as 2004. It is with all of the above in mind that we present, ample helpings of salt in hand, some of the common themes that studies of nightmare content have dug up. Limitations of the study include its dependence on retrospective interviews and its failure to specify the awakening criterion, definining a nightmare instead as a distressing or terrifying dream. If these themes seem vague to you, it's because they are. As you'll soon recognize, this is almost always the case with investigations into nightmare content. But then, dreams, themselves, are notoriously vague, are they not? 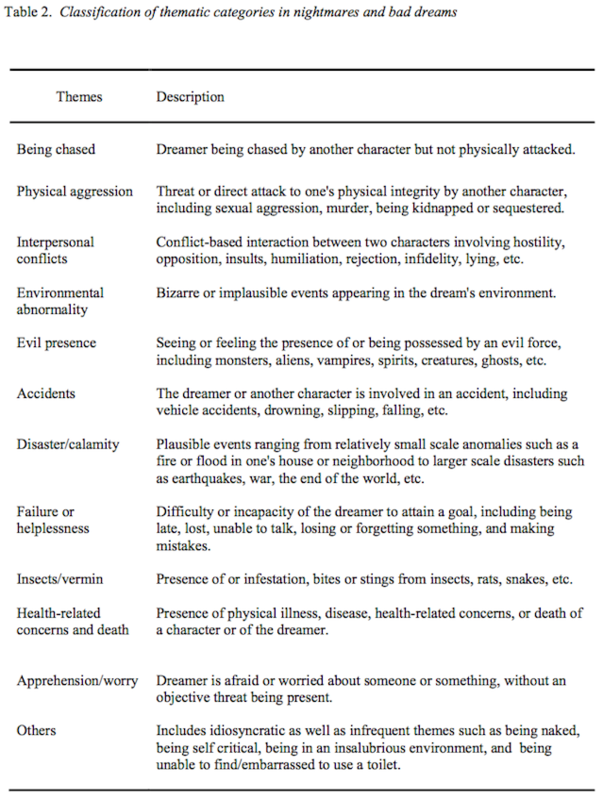 Barrett & Dunn's "Characteristics of nightmare subjects and their nightmares"
Barrett's study, like Cason's, does not specify the awakening criterion; her test subjects, however, responded to a retrospective questionnaire, as opposed to participating in interviews. Lawrence & Celluci's "Efficacy of systematic desensitization in reducing nightmares"
"The psychological activity that occurs in the waking and sleeping states seems to be a reflection of the general life pattern of the individual, his personal experiences in the past, his present interests and occupations, and his hopes and ambitions for the future." Schredl's "Nightmare frequency and nightmare topics in a representative German sample." Schredl's study makes specific note of the awakening criterion, though his test subjects completed a retrospective questionnaire listing 23 common nightmare themes. Zadra's "Thematic and Content Analysis of Idiopathic Nightmares and Bad Dreams"
The goal of Zadra's own study was "to obtain a comprehensive and comparative description of prospectively collected bad dream and nightmare narratives" using a large sample size comprising undergraduate students as well as members of the population. He also employed the "gold standard" method of dream collection, which requires test subjects to record their dreams in a log over extended periods of time. What these studies make abundantly clear is that settling on a list of the most common nightmares – let alone the most common nightmare – is no mean task. The studies listed above don't even manage to settle on a leading, universal theme. Of course, it's not difficult to imagine how the events of any given nightmare could be encapsulated by multiple thematic categories. Notice also how certain nightmare themes pop up in several different studies, albeit at different ranks and at higher or lower percentages. Be that as it may, it seems evident that the lack of a universally "Most Common" theme points to either the nebulous nature of nightmares or the difficult nature of their study; more probably, it points to both. We contacted Zadra for comment, but he was unable speak with us either by phone or by email. When we contacted Schredl to ask about why dream and sleep research has not managed to produce a more coherent picture of nightmare content, he emphasized that findings in such studies depend critically on methodology and sampling standards that are still very much evolving. "It depends whether you use a questionnaire or a dream content analysis, a student sample, a[ group of] nightmare sufferers, or a representative sample, as he did in his 2010 study. "All of these results are valid," he says. The key is finding a way to integrate them. *Consider, for example, that nightmares have been thought of as "frightening" dreams for close to half a century. More recently, researchers have come to acknowledge that a huge range of emotions are implicated in nightmares, including fear, anger, guilt, disgust, sadness and frustration. Zadra's study suggests that 35% of nightmares and 55% of bad dreams contain primary emotions other than fear. And yet, Zadra notes, few studies have actually investigated this range of emotions in any meaningful way.